Think for a moment about what the Star of David means to you. Does it have a real meaning to you, or do you just think that this symbol, given the label Jewish Star, is just there to resemble Judaism? 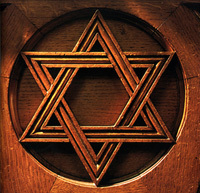 Before I researched about the Star of David, I thought it was meant to resemble pride and unity of the Jewish people. Now I have come to an understanding that my definition of the Star of David is correct, yet it is an opinion that I believe and there is a deeper meaning and history that I never knew. The original name that was given to this symbol was Magen David, which literally translated is Shield of David, but the shape of the hexagram is more commonly referred to as the Star of David. It is made up of two triangles; one upside down and the other right side up. Together, they make a six-pointed star. The Magen David has a relatively recent origin with no real connection to King David. It acknowledges that our military hero, King David, did not win by his own might, but by the support of the Almighty. The Magen David’s first use as a Jewish symbol was in 1354 in Prague, Czechoslovakia. Emperor Charles IV gave the Jews of Prague the right to have a flag. They chose the double triangle star as their symbol and displayed the banner in the 1500s when they welcomed the emperor to the city. In the mid 1600s an element was added to the flag. Prague was then under the rule of Emperor Ferdinand II. When Swedish forces attacked, the Jews helped to defend the city for the emperor. Ferdinand, in appreciation, gave the Jews the right to adopt a coat of arms, an honor that was previously reserved for noble families. The Jews added a Swedish hat to the star for their coat of Arms. In time, though, the hat disappeared from the emblem, and the star remained alone. Why the Jews chose the six-sided star is unknown. One theory is that in 300 BCE, Alexander the Great conquered Jerusalem. The Jews were left faced to fight for their religious freedom. The design on their shields was the six-pointed Star. The Greek letter Delta looks like a triangle; one stood for King David and the other stood for his decedent, the Messiah. In 1897, the first Zionist congress chose Magen David as their emblem. Later, it became the center Motif on the Israeli flag, and the Star of David is the Israeli equivalent of the Red Cross, which is known as the Red Magen David. During the Holocaust, the Nazis forced the Jewish people in Europe to buy and wear the identifying, yellow Star of David on all of their clothing. The star came to be yellow, because this color had been common in a negative and stigmatizing way to Jews for centuries already. Each country in Europe had a different badge with ‘Jews’ written on it in their language. Here are some that I found. (Show them with a poster and explain it.) After the war, Jews turned this symbol of humiliation and death into a symbol of honor and respect. When the state of Israel was founded, there was much debate over whether this symbol should be used on their flag since it was very controversial. The Star of David, now, is the symbol of a proud nation, a sign of hope for every Jew, who seeks protection in his or her own country. There are a lot of ideas on what this symbol symbolizes. One is that the triangle pointing upward symbolizes our good deeds which go up to heaven and then activates a flow of goodness back down to the world, which is symbolized by the triangle pointing downward. Another is that the two triangles represent opposites: good versus evil, spiritual versus physical, water versus fire. The six points of the Star of David are believed to symbolize God’s rule over the universe in all six directions: north, south, east, west, up, and down. The six sides at the center of the two triangles are lead to represent the six working days and the hexagon at the center represents the Sabbath. All those ideas are what writers and researchers conclude from their findings about the Star of David. This made me think about what everyday people might relate this emblem to, or even my family and friends. So I asked five people this question: "When you see, hear, or think about the Jewish star, what is the first thing that comes to your mind?" I asked a family friend and she thought about family, the temple she went to while she was growing up, and Israel. My mom’s cousin thinks about how great and proud he feels to be a Jew. It reminds him of the flag of Israel and it fills his eyes with joy and pride knowing he is one of them. I talked to my friend; she said, "I think about the Jewish people and how the people of Israel are having tough times because they are at war." Those three previous people were Jewish and had at least a little more background information then the next two Christian people I asked. My mom’s friend said, "When I see a Jewish star I think of the Jewish faith and the Jewish people. But I realize I don’t know anything much about the Jewish faith." My friend told me "the Jewish star reminds me of my Jewish friends." I asked 5 people of two different religions so I could see the difference in thought from one another. Some of their opinions included negative thoughts about the Jewish star; some of their opinions included positive thoughts about the Jewish star. Although their answers were on the spot and each person had a similar and vague perspective about the Magen David. The researchers and writers had time to think about how they saw the Star of David, so their answers are a lot more organized and clear. I was interested in finding out when the Star of David first appeared on jewelry, temples, mezuzahs, menorahs, etc. These facts were not easily attainable. I decided that people felt united and more self-confident having this symbol of their religious belief displayed proudly. It has given the Jewish people a sense of where they come from and identification of their religious history. I don’t find that the Magen David has a real meaning; I do know, however, that this Magen David has a symbolism and history behind it.